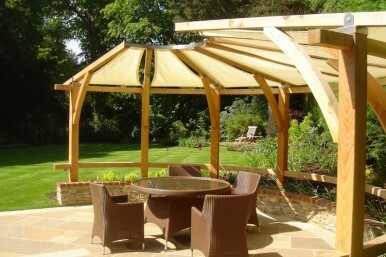 We designed this timber pergola in Farnham to reflect the use of timber on the exterior of the house. This was a design and build project, consisting of a front and rear garden phased over two years. The small stone wall retains soil, providing the paving and seating at the entrance into the curved wooden pergola area. The canvas sail shades were bespoke, as was the entire wooden pergola along with stainless steel fixings. The canvas sails were detachable. A full lighting, irrigation and rain water harvesting system were also installed during this project.